Inspired by my new toy, A Steam Cleaner, I did some spring cleaning yesterday. 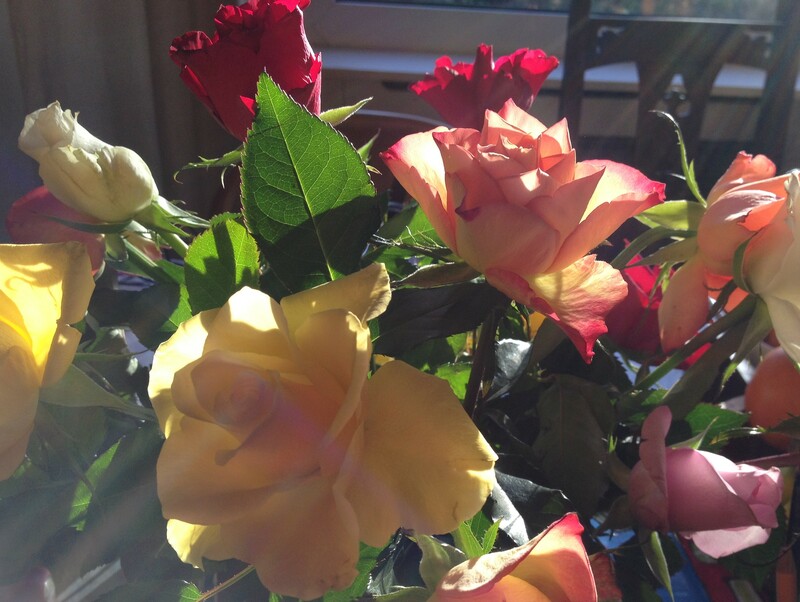 These roses looked wonderful in the sunlight and steam. 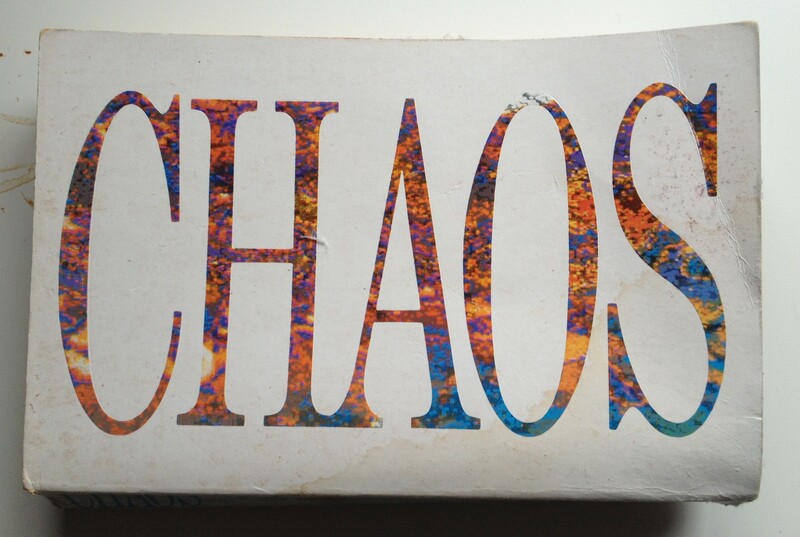 I’ve finished reading ‘Chaos’. It ends with some thoughts on the most wonderful natural system of all: our own bodies. Most of the focus at the time this book was published (1987) was on the functioning of the heart. It was known even then that a jolt of electricity could reset the rhythm of the heart when it was running out of control. This kind of rough treatment has also been tried on the brain and sometimes even seems to work, but can also result in damage. One of the difficulties of thinking about the mind in a Christian context is our tendency to split it into several separate entities. First there is the ‘mind’: A complex computing engine designed to figure out logical stuff. Then there is the ‘soul’ which deals with emotions and spiritual stuff. Both of these are somehow superimposed, but not quite part of, the ‘brain’ which is a wobbling mass of nerves and chemicals. … points of stability mixed with instability, and regions with changeable boundaries. Their fractal structure offered the kind of infinitely self-referential structure that seems so central to the mind’s ability to bloom with ideas, decisions, emotions and all the other artifacts of consciousness. If we think of the brain as only a sophisticated computer then we have to see the spiritual side of ourselves as separate and non-physical. But if we see it as an almost infinitely complex system, like the weather, then all of who we are can be incorporated into our real, physical brains. Once we think like this we can have a much more holistic approach to spiritual, mental and physical health. We can see the rhythm of a walk as a way of bringing us closer to the rhythm of God’s creation. We can see intense experiences of the Holy Spirit as being a way of resetting our minds into a better track – like defibrillating a heart. Every action, even spring cleaning, and every sight, like a bunch of roses, becomes part of the pattern of our minds. This entry was posted in Faith, Science and tagged Brain, Chaos, God, James Gleick, Mind on January 10, 2015 by Monica's Books. Sensitive Dependence on Initial conditions – How I started being a Christian. Evangelism seems a thankless task. All those books written to convince us that God is real and Jesus is important. All those talks. Then a book comes along which seems to have nothing to do with God and it flicks a switch and makes it possible to believe in God after all. The picture here is of that actual book (Chaos, by James Gleick). It’s a bit mouldy and bent out of shape. It’s a great book and I would recommend it but, unless you are also a computer geek with an art degree it probably won’t change your life. Truly random data remains spread out in an undefined mess. 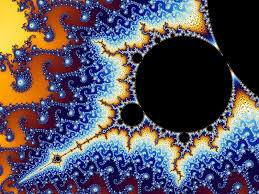 But Chaos – deterministic and patterned – pulls the data into visible shapes. Of all the possible pathways of disorder, nature favours just a few. But it is not straight lines and geometric shapes either. Go for a walk and look at the clouds. They are all different yet we know they form a pattern. That pattern can be modelled or represented using mathematics and so can the trees and the grass. This is how modern animators make their films look so real, using ‘fractal geometry’. This kind of geometry can be very complex but the principle is fairly simple. You take a function (often including an ‘imaginary’ number like the square root of minus 1) and run it over and over again for each spot on the graph, each time feeding back the result of the previous calculation. Do this thousands of times and, depending on where the result ends up, colour your spot a different colour. This image is the output of such a process called a Mandlebrot set. One of the interesting things about this kind of maths is that, even if you do exactly the same maths, if you change your starting point very slightly (say by 0.00001) the results can be very different. This has become known as the ‘Butterfly Effect’ (because a butterfly flapping its wings in China can cause a hurricane in the USA) or ‘Sensitive Dependence on Initial Conditions’. For me, that was the switch. I had been struggling to see what role God could have in the world. Then I had the idea that God was nudging the world subtly by changing the Initial Conditions, setting it off in a different direction every now and then. It was a very small role for God indeed and my conception of God’s role in the natural world has grown and grown until I feel we are literally surrounded and kept alive by the wonder of His ever changing world, but that is how I started being a Christian. This entry was posted in Faith, Science and tagged Chaos, Computing, God, James Gleick on January 6, 2015 by Monica's Books. A highly improbable universe. Notes from the Book club. The true light that gives light to everyone was coming into the world. He was in the world, and though the world was made through him, the world did not recognise him. He came to that which was his own, but his own did not receive him. Yet to all who did receive him, to those who believed in his name, he gave the right to become children of God – children born not of natural descent, nor of human decision or a husband’s will, but born of God. Imagine a chilly desert night. Jesus and His friends gathered around a fire. One of them leans back, looks up at the stars and says: ‘Tell us how it all started Rabbi’. So Jesus starts ‘In the beginning…’ and they all settle back to hear the familiar story. But instead of the story they all know He begins to talk about a word, an idea, being the start of it all and He himself is the Word, and caused all things to be made. Not the normal story of animals, plants and people but a universe born out of an idea and a person. He wouldn’t have got it out in one go. There would have been questions, lots of them. But through it all John sat quietly, listening, his poet’s brain working out how to write the conversation down. To me, it makes perfect sense. If God needed to create a universe with living breathing creatures that could be his children; if He wanted His own son to become a living breathing human being and be with these creatures then this would be the way to do it. The purpose was there right from the start. It is the most human purpose of all, to create a family. The remarkable picture that is gradually emerging from modern physics and cosmology is one of a universe whose fundamental forces are amazingly, intricately, and delicately balanced or ‘fine tuned’ in order for the universe to sustain life. Recent research has shown that many of the fundamental constants of nature, from the energy levels in the carbon atom to the rate at which the universe is expanding, have just the right values for life to exist. Change any of them, just a little, and the universe would become hostile to life and incapable of supporting it. Theoretical physicist Paul Davies tells us that, if the ratio of the nuclear strong force to the electromagnetic force had been different by 1 part in 10 to the power of 16 (10 with 16 zeros after it), no starts could have formed. The distance from the earth to the sun must be just right. Too near and water would evaporate, too far and the earth would be too cold for life… Astrophysicist Hugh Ross lists many such parameters that have to be fine tuned for life to be possible, and makes a rough but conservative calculation that the chance of one such planet existing in the universe is about 1 in 10 to the power of 30. We were much taken by the sheer improbability of the universe. This does seem to show a real intelligence in its design. And this does not mean that we need to find the ‘gaps’ in science to make God real (I am in debt to Wendy for pointing out my tendency to fall into the ‘God of the Gaps’ error). For instance there is currently almost no evidence for how individual species get started. The fossil records do not show a gradual change between one species and another. What they actually show is new species coming into being very suddenly and then staying the same for millions of years. They then die out and are replaced by other species. Once we know this it is tempting to say ‘Oh, that means God steps in and miraculously creates new species’. Well that could be the case or it could be that there is a scientific and physical explanation for how this happens. Evolutionary biology has only been studied for about 150 years and there must be a lot left to learn. The truth is we do not need to find holes in scientific knowledge to reveal God’s work. Science itself will provide this evidence. Each cell has, curled up within it, about 2 metres of DNA with 7 billon bits of information. The information in the DNA is used to create proteins, the simplest of which have about 100 amino acids. Each protein must be perfect and precise otherwise our bodies will not work properly and all of this is happening every moment of every day without us even being aware of it. Although DNA itself seems to stay the same the information it expresses does not as bits of it can be turned off and on. It is grindingly, creakingly, crashingly obvious that, if Darwinism were really a theory of chance, it couldn’t work. You don’t need to be a mathematician or physicist to calculate that an eye or a haemoglobin molecule would take from here to infinity to self-assemble by sheer higgledy-piggledy luck. Before I finish this post I’m going to go back to Jesus and His friends sitting under the desert stars. We have become used to the idea that the natural and supernatural are separate, that stuff happening in the world around us is caused by one or the other but not both. But the ancient Jews did not see things that way. For them, there was no dividing line. I think we need to recapture that, to see everything as God’s work. I love science. I love what it tells me about the world we live in but it is all God’s world. 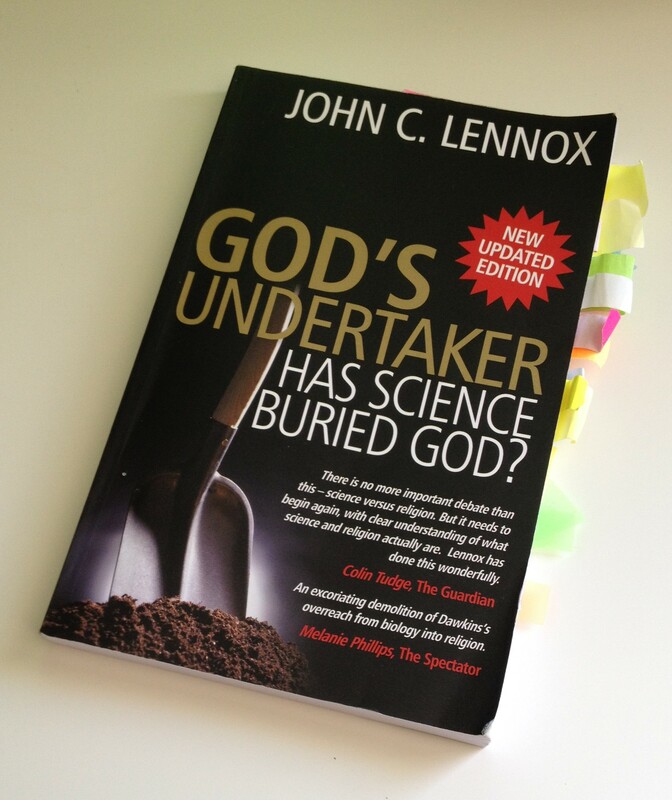 This entry was posted in Faith, Science and tagged DNA, God, Jesus, John 1, John C. Lennox, Science on September 27, 2014 by Monica's Books.